Okay—everybody back? Are you all comfortably sitting down, freshly used smelling salts at your side, the breath that was knocked out of you by the story's stunning finale gradually re-entering your collapsed lungs? Good. NOW we can pick away mercilessly at our featured presentation, “The Infamous Four”, written by Jerry Siegel, drawn by Kurt Schaffenberger, and originally published in SUPERMAN'S PAL, JIMMY OLSEN number 89 (December 1965, but going on sale earlier that Fall in late October). By now, you've been able to surmise my reason for posting it on this very specific date, as it deal's with events taking place in Superman's Metropolis exactly 59 years from today. Yup, folks in Supes adopted home town are still stricken by the tragic assassination that had taken place precisely a century earlier, which, frankly, may've been a bit of wishful thinking on the part of the comics field's most blatant JFK groupie, Superman uber-editor Mort Weisinger. After all, wasn't the very year THIS story was published, 1965, the hundredth anniversary of the shooting of one of our OTHER most beloved presidents, Abraham Lincoln? And yet, thinking back, I can recall no special ceremonies when THAT dark day rolled around (heck, I don't even know WHICH day it was!... ), and certainly nobody took five minutes off to stare, stone-like, at the front of a five dollar bill (the technology to project an image of a bearded chief executive into the ether not having been invented as yet)! Instead, we twelve-year olds were more likely to crack our black-humored “...but besides that, Mrs. Lincoln, how'd you like the play?...” jibes as to pay tribute to a fallen hero (hence the above title). Mort Weisinger's Superman Family of titles were primarily responsible for sparking my interest in adventure-themed comics in 1961, when I was eight. Four short years later, the bloom was definitely off the rose: Marvel Comics had come along in the intervening time, and by late 1965, DC was desperately trying to seem hip, as both their surprisingly new (yet old) competitor--AND the decade's rapidly evolving styles, mores, and attitudes--were making their fifties-based approach (once the industry model) seem stale by comparison virtually overnight. 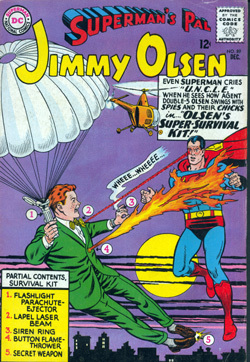 To that end, DC was only a month or so away from their lamentable Go-Go Checks era, which would tarnish the uppermost reaches of the cover of the very next issue of SUPERMAN'S PAL, JIMMY OLSEN. Even a quick look at this cover is a clear indication of how the clueless National Comics big-wigs were flailing about, trying to hop aboard any available band-wagon in the hopes of not being left too far behind. The times, they WERE a-changin'--even, it would seem, in the halls of four-color fantasy publishers. Come the mid-seventies. Having grown up with friends who weren't at all interested in comics, I was lucky enough to eventually meet a kindred spirit while attending college by the name of Charlie Johnson. Though we soon became great pals, he lived 30 miles away from me in those days, so our visits were severely limited by the excessive distance. When we did manage to get together at my parents house, we'd gleefully go down into the basement and enthusiastically rifle through the piles and piles of comics, discussing, celebrating, and—the most fun of all—good naturedly mock them!! And there was this one story in particular I was near desperate to show him—it was this bizarre Jimmy Olsen story that ended with a snap ending, one that ALSO served to memorialize JFK! This sad scenario repeated itself over the years, again and again. When my pal Rocco first visited, I described to him what I remembered to be a particularly oddball Jimmy Olsen story, one containing an outrageous denouement, and then I'd proceed to page through issue after issue of SUPERMAN FAMILY, always with the same frustrating result—no such story! I was beginning to doubt my own sanity! I hadn't imagined everything—had I? Repeatedly, this would occur when I'd host any visitor with half an interest in comics—and if that weren't bad enough, my memory of the tale in question began to strangely morph in my muddled mind. While that final panel of a saintly John F. Kennedy hovering in the sky remained crystal clear in my mind's eye, and the key plot element of everyone standing completely still in deference to the moment, thus outing the bad guys who, ignorant of the local's customs, were running through the streets just as everyone else voluntarily freezes—THAT stayed with me, too. But, vaguely recalling how everyone was dressed, I had somewhere along the line decided that this adventure DIDN'T take place in a future version of Metropolis, a century after the assassination, but instead in the bottle city of Kandor!! So Charlie? Rocco? And anybody else I may've once regaled with that crazy JFK/Kandor crossover, here it is. I, um, got a few of the details screwed up—hey, can you really BLAME me? Much as I dearly love Kurt Schaffenberger's work—and I DO—the futuristic garb his characters are wearing look EXACTLY like the sort of fashions you'd likely find in mid-sixties (not-so-swinging) Kandor, giving me SOME small excuse for my confusion. Lou informs me that this story's never been reprinted, and frankly, I doubt it ever will be. Not to play fast and loose with someone else's property, but when you add in the historical, ahem, importance of this unique entry with my above observation, I think we're on reasonably solid ground offering this up for your perusal. As for those OTHER two stories? Well, I've gotta save something for the next two November 22nds, don't I?